Bill McDaniel resides on Whidbey Island, Washington with his wife Shirley. A whole person is more than his parts…and as he gets older, considerably more so. He was born on a small farm in Oklahoma. His sisters lobbied successfully to name him after their old German Shepard dog whose name was, interestingly enough, Bill. A studious lad, he was addicted to climbing high trees and sitting in them reading. This was the only way he could get out of chores and away from his very talkative sisters. He became adept early on at deflecting attention and blame away from himself and toward the sisters, who reflected it immediately back at him…as well as fists, broomsticks, and the occasional BB gun product. Life on a small farm is always hazardous to one’s wealth. So Bill joined his family at age eleven traveling the West while his father worked on pipelines. By the 10th grade he had attended eight schools and had only a single academic credit completed, and that was in advanced Spanish, having skipped the basic version to save time. His resultant Spanish vocabulary is limited to only a few very large words. From the 10th grade on he stayed with one of the aforementioned sisters (Ruth) in Blackwell, OK, where he managed to complete his last 3 years of high school. Finally, by virtue of outlasting several opponents, Bill won the state wrestling title in Oklahoma and got a full scholarship to Oklahoma State University. At OSU he was a moderately successful wrestler and somehow managed to become President of the Senior Class and of the Arts and Sciences Student Council. He had the perhaps dubious honor of being named “Campus Clod” of 1963 at OSU; his hometown papers were unsure whether or not to publicize this accomplishment, however. Trying to shed the corpulence from his body in the sweat room while pulling weight for wrestling gave him plenty of time to learn the fine art of playing bridge and to become adept in the pre-med required studies. (It should be pointed out that books and cards do not fare well in a sweat box!) He subsequently applied for and was admitted to medical school. Realizing in medical school that he was prone to psychically acquire every disease he studied about, he elected to treat only healthy people and eventually became an orthopedic surgeon. In 1969 he married and joined the Navy. He shared this adventure with daughters Valerie, Natalie, Tara, and his wife, Shirley; the fact that he was abroad some of the time undoubtedly added stability to his marriage and family life. In addition to his Navy duties he thoroughly enjoyed wrestling on Navy teams, working for the Olympics as a physician in the 1984 games, and serving as the team doctor for many diverse world championships in sports that he had only vaguely heard of. In 1994 Oklahoma State University inducted him into the OSU Hall of Fame. Most people therein have major accomplishments; Bill’s talent seemed to be an absolute ability to find something fun in everything he did! Since leaving the Navy in 1997 Bill has lived a life of penurious luxury and vigorous leisure for the most part. He hiked the 2174 mile Appalachian Trail and many diverse trails in the country, proving once again that bears have good taste and will never munch on a very smelly hiker. He has served on the boards of mostly now defunct companies and hopes there is no direct connection between the two. In 2005 he spent three months working for the Navy after the Banda Aceh, Indonesia, tsunami, helping coordinate care given by the US medical teams. Inasmuch as he is Irish and has a gift for gab (so noted all those years ago by his four sisters and much more recently by his wife, Shirley) he has traversed the country many times speaking about this event. 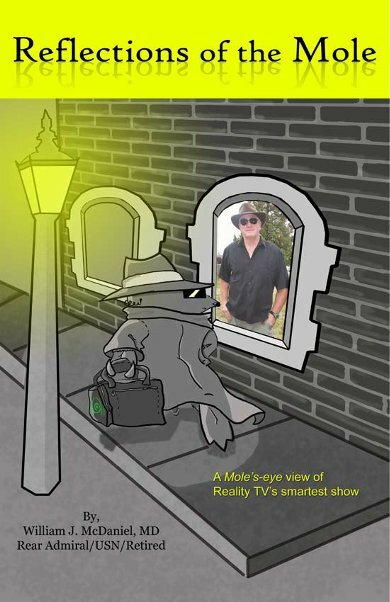 Knowing his penchant for unique challenges, Shirley encouraged him to apply for the smartest reality show on TV (and one a senior citizen could compete in), “The Mole II.” He did so and was inexplicably accepted as a participant in 2001. To none of his friends’ surprise he was eventually revealed as the mole on that show. His sisters all said, “Couldn’t have been anyone else. We trained him well.” Having nothing more productive to do, and still living a life of penurious luxury, he has attempted to rectify the penurious part of his life by writing this book. He does indeed hope you buy many copies for all your friends and family. It will make good fodder for Christmas, Bar Mitzvah parties, birthdays, and various rodeo events.